This was a day for families. 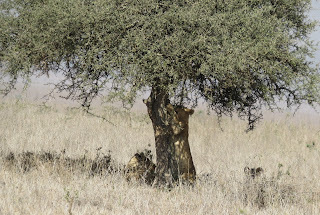 . . the ostriches, the jackals, the rhinos, and then as we were leaving, we saw several lions lounging under a tree. It's been a great day! Cute little family of black-backed jackals. The mother ran away. I thought she would stay to protect her young. Oh well. the babies weren't even scared of us. They went back and forth under the road through a culvert. So cute! Wished I could have picked one up and cuddled it. Jackal pups by their den, which was a culvert under the road. Look at the video below. So cute. 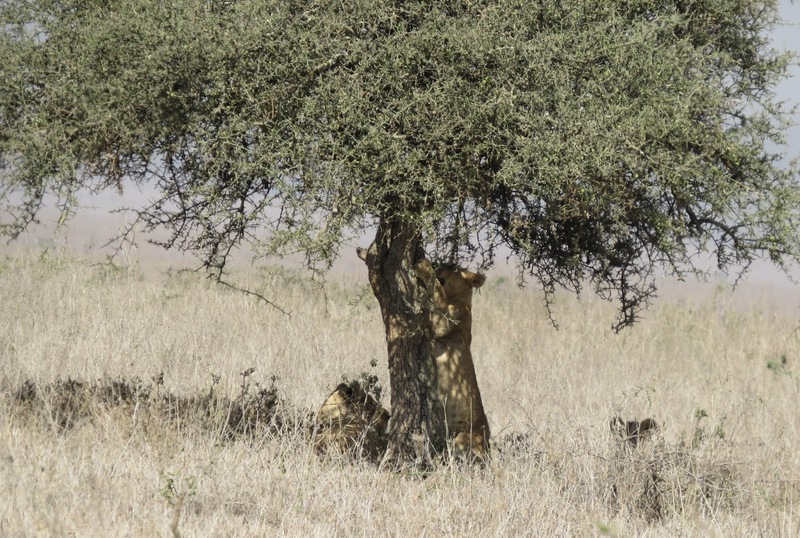 A family of lions (minus the dad) was lounging under a tree. Look at the tree -- there's a lion stretched up as if she is going to climb it. That would have been fun to see. The lion in the video below is the one that is climbing the tree.